Our UV water treatment systems focus the power of concentrated UV light for disinfection and chloramine reduction in recreational water systems. Traditionally, chlorine has been the favoured method of disinfection for pools but the industry is now aware of the advantages that UV water filters can make to the situation. It increases bather comfort and promotes staff health by reducing the amount of chlorine needed to provide residual protection in the pool. Of particular concern in swimming pool water is the formation of chloramines that are well known for that swimming pool ‘smell’, ‘red-eye’, nose and throat irritation. UV filters break down the chloramines to greatly reduce the smell and is very effective at disinfection. In particular Cryptosporidium oocysts are resistant to chlorine disinfection and can survive for days in treated recreational water venues, but are easily treated with a UV water treatment system. If you catch Crytosporidiosis you will suffer from diarrhoea & vomiting. It’s most common in 1-5 year olds, which is of course, the age group that finds splashing around in pools irresistible. UV disinfection represents a powerful technology that has been successfully deployed in swimming pools for many years and is not designed to completely replace chlorine. 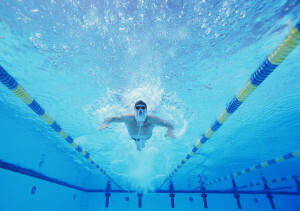 Chlorine provides residual disinfection in the pool, but through an elimination of the need for periodic “shocking”, well-maintained pools can see significant reductions in chlorine usage as well as reduced staff health problems and increased bather comfort by installing a UV water treatment system. This is the most common application of UV light in water treatment. Correctly sized UV water filters are designed to meet a minimum of 3 Log reduction, a minimum of 30,000 micro-watt seconds (or 30mJ/cm2) at one year, the end-of-lamp life (EOLL). This includes Cryptosporidium Oocusts. Bathers introduce organics to the water, such as bacteria, urine, sweat and other excretion products. These react with the chlorine necessary to provide residual disinfection to produce unwanted by-products. Of particular concern in swimming pool waters are the formation of chloramines and chlorinated organic compounds that are known to give rise to swimming pool odour and eye, nose and throat irritation. While the addition of chlorine to pool water may control bacteria levels, there is growing awareness regarding the negative health impacts of chlorine and its by-products. UV filters, sized for chloramines reduction (60mJ/cm2) delivers a sufficient UV disinfection dosage to inactivate Cryptosporidium. UV filters can also significantly reduce the microbial counts by destroying at least 99.9% of the bacteria present in the pool water, when installed after filtration.